So I’m having a relatively quiet weekend staying in out of the cold. There’s nothing better than being cosy on your sofa watching delicate soft snowflakes fall outside your window. After having an awesome meal at my friends last night, (a delicious creamy gratin infused with lime and lashings of peanut butter – well worth a mention don’t you think?) I’m feeling inspired to make something a little bit special for breakfast. 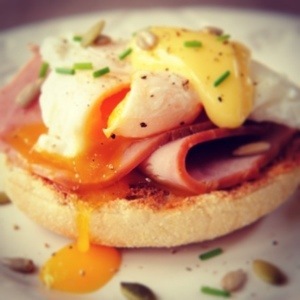 This morning I’m craving a classic favourite; beautiful eggs Benedict. My definitive morning choice at any restaurant or cafe. Who can beat smoked grilled ham resting on crispy muffins and perfectly poached soft gooey eggs topped with a rich indulgent Hollondaise sauce? It’s the king of all breakfasts. It’s not however quite as easy to recreate this tasty little breakfast bite. I’ve only tried Hollandaise sauce a couple of times and both times were mildly unsuccessful! My first attempt the egg scrambled. Second attempt I achieved a gorgeous creamy consistency but went a little overboard on the lemon. Would have been great if I was making fish. Sadly I was not. Having watched countless cookery programs trying to master the art, here goes nothing …..
My little tip is to pop the eggs (in their shells) in boiling water for about 30 seconds. This way the eggs cook slightly so they form a loose shape in the shell. When you break the egg it means it reduces the chances off the egg from spreading in the boiling water. Next make sure the water in boiling then. Add a tablespoon of vinegar. Make a well in the water and break the egg into the middle. Poach the egg for a few minutes, until you see that the colour of the egg starts to darken. Put the vinegar into a pan with the peppercorns and bay leaf, then boil on a high heat until it reduces by half. Strain the mixture separating the vinegar from the peppercorns and bay leaf. Either whisk or blend the egg yolks together with your vinegar reduction. Melt the butter on a low heat, then slowly pour into the vinegar reduction and either blend or whisk vigorously if you are mixing by hand. Once the sauce starts to thicken, add a squeeze of lemon and season with salt and pepper. Toast two muffins, place some thick slices of smoked ham on top of the muffins and grill for a couple of minutes, then top with your gooey perfectly poached eggs and cover with lashing of buttery Hollandaise. Sprinkle with a little chopped fresh parsley and enjoy a gourmet brekkie from the comfort of your own home.